ALL BLOCKS HAVE 6015 in the block casting number. This is found on all blocks and is Ford's number for an engine block. EAL 279 cu. in. V8 1954 Ford HD truck. see Lincoln page. EBJ 341 cu. in. V8 1955. Early Lincoln OHV engine. See Lincoln page. ECU 368 cu. in. V8 1956-57. Early Lincoln OHV engine. See Lincoln page. EBU 239 cu. in. V8 1954 cars only. LARGE CAM BEARINGS. ECG 272 cu. in V8 1955 to 57 cars and trucks. Typically Dearborn casting. 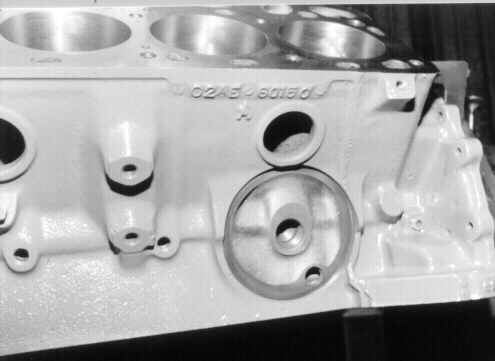 PLEASE NOTE: 292 and 312 Blocks were machined from the same castings with the same markings. If the following blocks have EBU main caps it is a 292, if it has ECZ main caps it is a 312. ECZ-A 292-312 cu. in. V8 1956 ECZ 6015 A With EBU main caps =292. ECZ main caps =312 Check crank flange or main caps. NOTE: 6015 is Ford's number for an engine block. All blocks have this number. 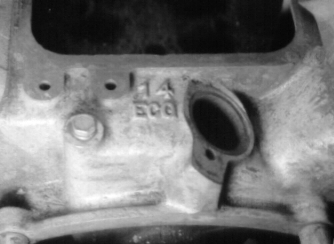 Block identification number generally on side of block above oil filter for blocks cast at Cleveland. Dearborn block I.D. number near distributor and above generator. Most Dearborn blocks used in trucks. No Dearborn blocks after 1957. There were no special truck blocks. Heavy duty trucks with steel cranks used C1AE or C2AE car blocks. Dearborn numbers, also found (upside down) near generator. Typically 272. 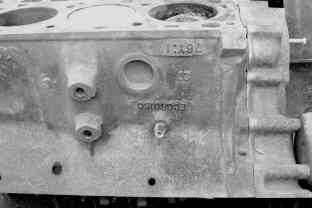 There were some EDB 292 blocks cast at Dearborn. Dearborn symbol is DIF indicating Dearborn Industrial Foundry. There have been no reports of any 312 blocks cast at Dearborn.